Sleeping function, high decorativeness and comfort – each modern corner L-shaped sofa is a product for your living room. 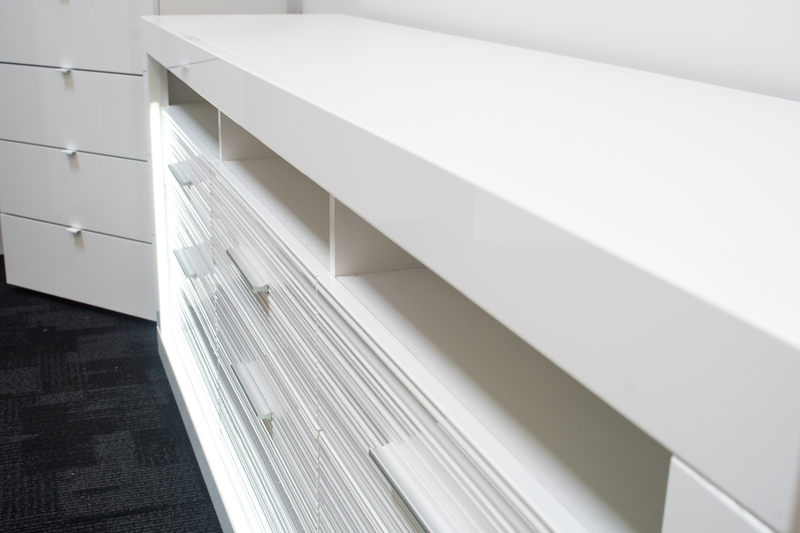 They are available in a range of colours and upholstery materials to suit contemporary and traditional space. 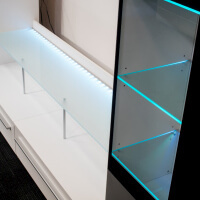 High gloss or mat modern furniture manufactured in a whole range of colours, forms and sizes. 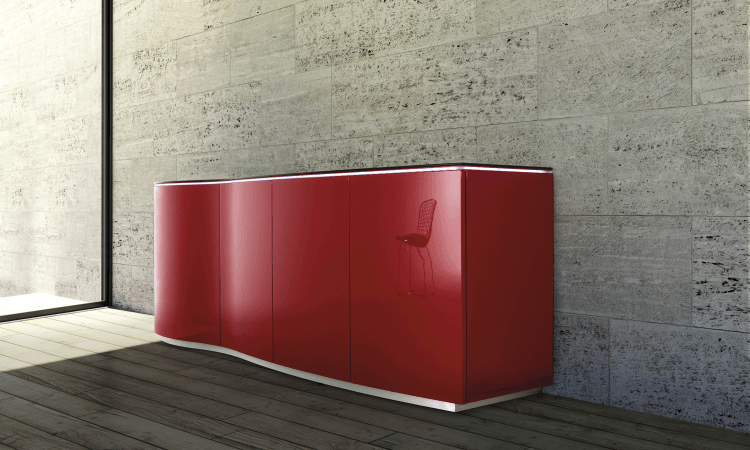 The bespoke sideboards are ideal for living rooms, corridors and other space inside your UK house or apartment. Practicality and unique design, make them constantly a popular choice amongst UK buyers. 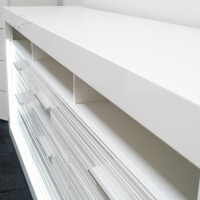 The white gloss TV units are believed to fit in with modern interiors, but can blend in with other designs as well. Are you planning some changes in the arrangement of the flat? Check hot trends in 2018. The beginning of spring is the time of changes for many people. If they refer to a move, a repair, buying a flat or making arrangement changes, it is worth remembering that year 2018 has brought with itself a breath of fresh air and plenty of new trends. What is fashionable in year 2018? What shouldn't we forget about when arranging our flat and what things it is better to forget about? How to arrange a stylish living room? See five interesting ideas! The timeless elegance in the living room is a style that never gets boring, however, it requires considerable expenditure at the beginning. In order for stylish furniture and decorative elements to accompany you for years and please the eye for a long time with their sophisticated form and high-quality finish, go shopping at SENA online shop. There you can find classic and comfortable seating sets, preferably in subdued, neutral colours or leather, as well as elegant lamps. The function of accessories in such a room is played by patterned wallpaper on the wall, cushions with sophisticated patterns, as well as a carpet or mirrors in ornamented frames. Sculptures and decorative figurines in the arrangement of the apartment. We choose accessories for your home style! Despite the passing time, sculptures and decorative figures are as popular now as they ever were. Interior design trends constantly change, and so do the types of home decorations. We offer you living room designs in various styles, with figures constituting the decorations! What dining room table should you choose? A dining room table is one of the most important things in the house. It usually involves receiving guest, celebrating and spending time with family. Before buying it, you should think about where the table should be placed. Of course, everything depends on the arrangement of space. The best solution is, of course, a separate dining room envisaged in house or flat design. We recently purchased a u-shaped sofa from Sena and are very pleased with the results. The sofa came earlier than expected and looks perfect in our lounge. I do not like to buy furniture, especially a sofa, without sitting on it first. In this case I took a chance and did not regret doing so. The service was excellent, right through to and including delivery. You are in a place where a huge choice of the most original modern furniture items along with great value for your money come together. 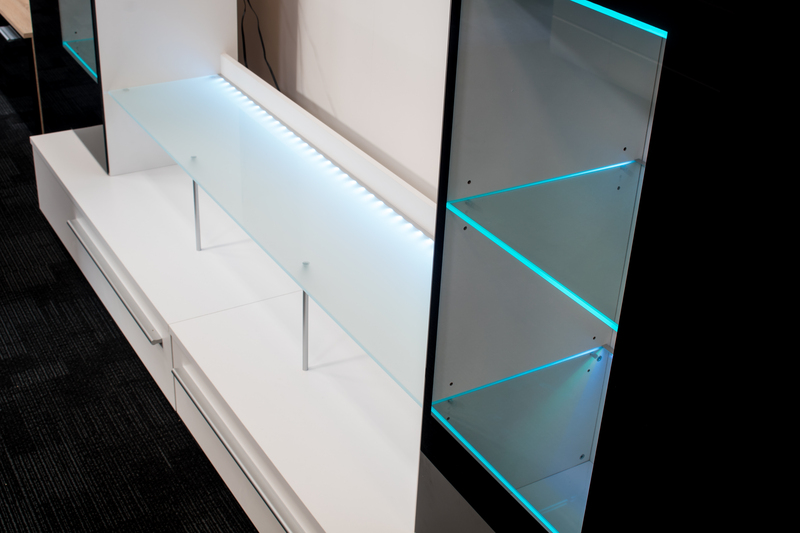 In the vast offer of our online shop we have included unique pieces of high gloss furniture or simpler mat products with wooden finish. They are chosen by creative interior designers and those people from the UK, who look for quality and one-of-a-kind style. 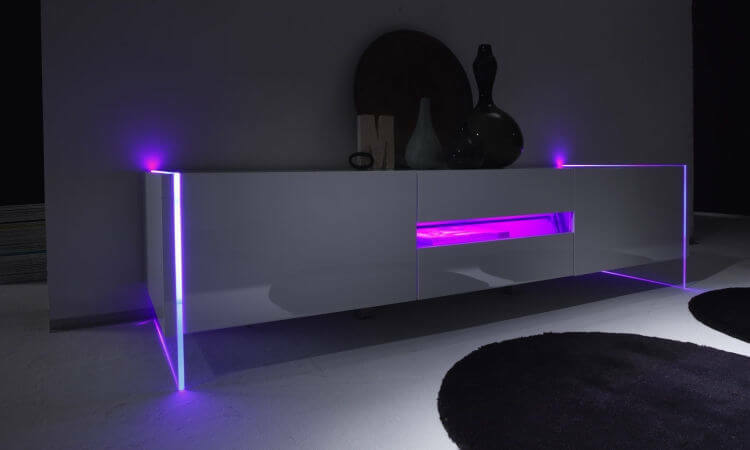 Great white gloss TV units will let you enjoy every minute spent in the living room, black bedroom furniture is a fantastic choice for the most elegant houses, while modern sideboards will surprise you with their innovative form and a variety of available colours. The product range is extremely developed and diverse, thus allows everyone to find an amazing L-shape sofa, modern corner sofa and other items in great prices. To ensure the highest customer satisfaction, SENA offers as well professional installation services. We source our L-shaped sofas, TV stands and other products from across Europe so we can offer you a range of items that you will not find on High Street. Few can deny the allure of modern furniture - it's sleek, it's elegant, and it will make your home look more distinguished. Through effective use of modern furniture, you can make any interior much brighter, lighter, and overall just more pleasant to stay in. 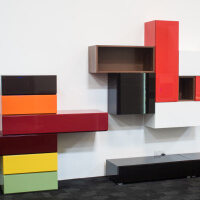 Sena Home Furniture offers you a selection of some of the best modern furniture available in the UK. Made using the best materials and the latest technology, this incredible range of furniture will be the perfect fit for your bedroom, living room, and more! 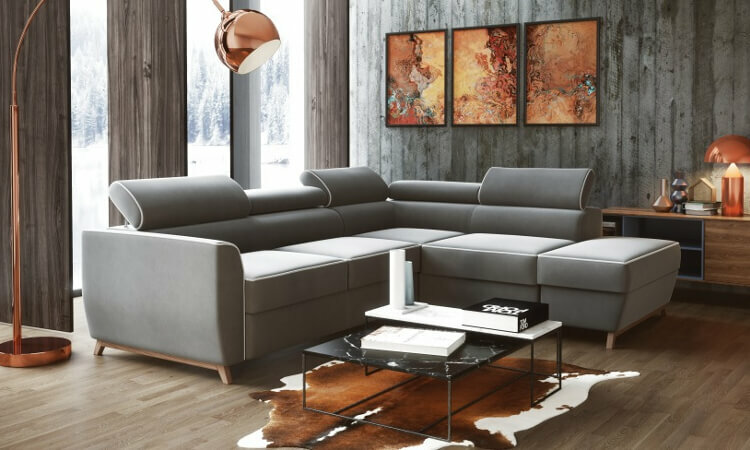 Whether you're looking for a sofa, office chair or table, whether you want it in high gloss or natural wood, Sena Home Furniture can offer you some of the best modern furniture available online, as well as in physical shops, in the UK. You can trust us - our furniture is of the highest quality, no matter what you choose, and it won't cost you a fortune. With the help of our amicable staff, you’ll make your purchase in a pleasant manner. 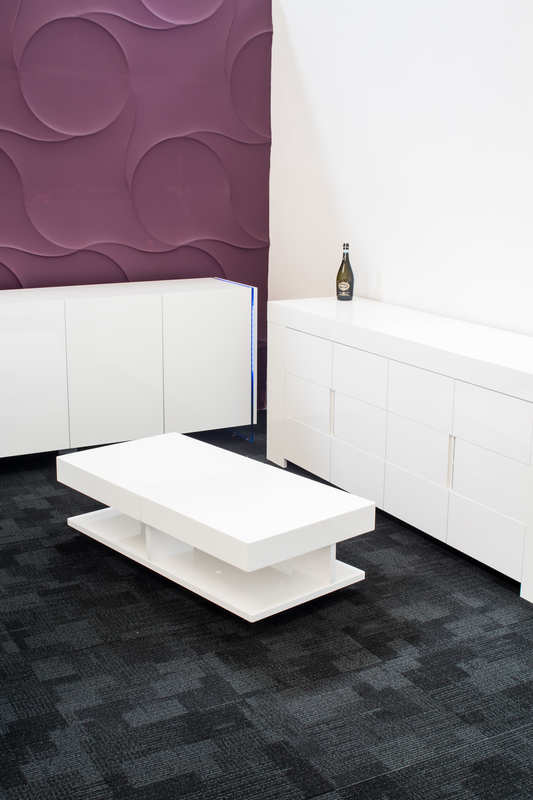 Our modern furniture is very affordable, giving you great value for your money. We also often put out items on sale, so you can expect some nice discounts on our products from time to time. 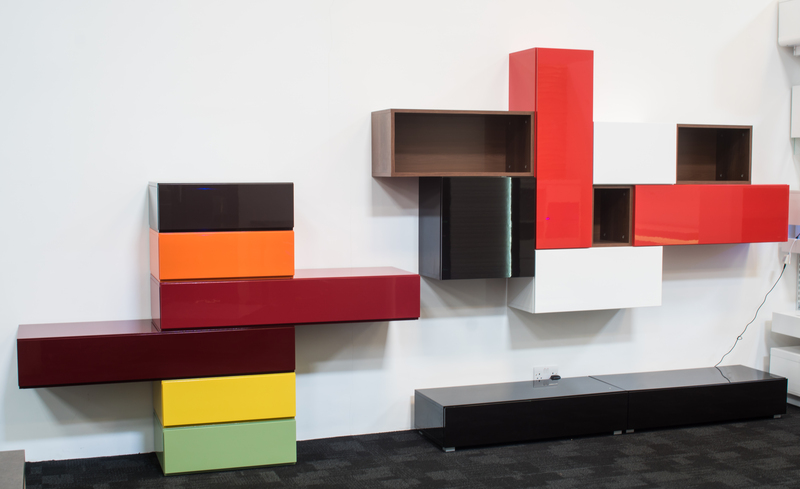 Revitalise your interior with our modern furniture today! For the comfort of our Customers, we created a modern, outstanding Showroom, comprehensively equipped with innovative furniture! A beautiful range of sets will get your attention and solutions offered will enable you to find something that perfectly fits to your needs. A team of professionals is waiting to take you on tour through especially prepared rooms! When passing our modern office you can grab yourself a nice coffee prepared especially for you, to make your visit even more enjoyable! Here our attention is focused on your satisfaction. Constantly innovating, we provide our Customers with confidence and professionalism backed by our experience. Our whole focus is directed to meet your expectations, valuing your time and convenience, therefore we introduced our support service led by our knowledgeable Product Manager Mark. In every moment whether you get stuck with assembly, need installation instruction, need more specific information about product or you are unsure which product to choose, Mark will help you out with all product related queries. His passion towards SENA often results in his quick response even at 9pm! To ensure the highest quality service is provided, each claim is under an individual assessment in accordance with our Terms and Conditions. Due to precision as well as accuracy of the analysis, verification takes up to 48 hours. Each response includes a detailed information on further action required in relation to the complaint. Full description of warranty can be viewed in our Terms & Conditions Policy. To ensure that our Customers get professional, on time delivery service we use our own transport.Our friendly delivery team is always out there happy to help you.Regular runs across England, Scotland and South Wales are provided in order to deliver to you regardless of part of United Kingdom you live in.To save your time on waiting, a member of our Customer Service Team informs you about dispatch date at least 24 hours prior to dispatch and then the driver calls you an hour prior to his arrival unless you wish otherwise.Each item is being well protected with packaging to guarantee safety and confidence of product delivered.